Stephen Mitchell is widely known for his ability to make ancient masterpieces thrillingly new, to step in where many have tried before and create versions that are definitive for our time. 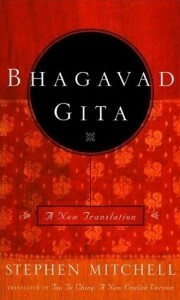 He now brings to the Bhagavad Gita his gift for breathing new life into sacred texts. The Bhagavad Gita is universally acknowledged as one of the world’s literary and spiritual masterpieces. It is the core text of the Hindu tradition and has been treasured by American writers from Emerson and Thoreau to T. S. Eliot, who called it the greatest philosophical poem after the Divine Comedy. There have been more than two hundred English translations of the Gita, including many competent literal versions, but not one of them is a superlative literary text in its own right. and be free of suffering, forever. eternal, and a joy to practice. shuttling from death to death. I am not confined within them. all beings remain within me. the myriad forms of life. These actions do not bind me, Arjuna. and sets the whole universe in motion. as the Lord of all life and death. hymn to my endless love. gods, they can see my face. Öm, and the threefold Vedas. only what will pass away. a reward that never can be lost. even though they don’t know it. they come to me in the end. if given with a loving heart. or pray or enjoy or suffer. untroubled, you will come to me. I favor none and reject none. within me and I live in them. as he moves toward me on this path. his heart finds eternal peace. loves me will ever be lost. will attain the ultimate goal. people, or for those with pure hearts. turn to me, and find freedom. and you will attain me at last. “The Gita is a love song to reality, a hymn in praise of everything excellent and beautiful and brave.” Time and again Mitchell’s rendition evokes just that… It is a moving text, poignant, beautiful, haunting. Mitchell must by now be accounted one of our generation’s heroic translators, having taken on the Book of Job, the Tao Te Ching, and Genesis and done so much to popularize Rilke in English. Now he applies his considerable skill and sympathy to one of the most noted sacred texts of Asia, the Bhagavad Gita, and the results are very happy… Highly recommended. As Mitchell notes in his excellent introduction, the Gita is not just one of the core texts of Hindu religious philosophy; it has been a key work in the development of American literature as well… Mitchell has the uncanny ability to usher originals into an English of beauty and resonance without making them all sound alike. His Gita is dazzling without ostentation… This is a handsome and expertly translated version of one of the world’s most important religious poems. Few events in publishing these days can be called joyous and historically significant, but the appearance of Stephen Mitchell’s new translation of the ancient Hindu holy book the Bhagavad Gita is such an occasion… He has created a verse translation of the Gita that moves more quickly and is more accessible than the previous translations… [This is] the perfect book to delve into whenever you feel a need to enter… a world in which we are eternal, radiant, and loved. Mitchell must by now be accounted one of our generation’s heroic translators, having taken on the Book of Job, the Tao Te Ching, and Genesis and done so much to popularize Rilke in English. Now he applies his considerable skill and sympathy to one of the most noted sacred texts of Asia, the Bhagavad Gita, and the results are very happy. He works in free-verse quatrains of about three beats per line, and his language flows with great naturalness. Inevitably, this text will remain both ancient and foreign to many modern readers, but Mitchell’s work goes a long way to making these words…[drive] away your ignorance and delusion. Highly recommended. Thoreau said of this Indian masterpiece that “in comparison, our modern world and its literature seem puny and trivial,” while Gandhi claimed that those who meditated upon it would “derive fresh joy and new meanings from it every day.” The sixth book of the epic Mahabharata, the Gita is one of Asia’s most renowned spiritual texts. Mitchell, whose translation of the Tao Te Ching has been extraordinarily popular, offers a direct, clean translation of the Gita that reads like a series of pithy epigrams of advice and comfort… Mitchell clarifies meaning without sacrificing beauty and emotional resonance. Recommended for libraries whose patrons show strong interest in non-Western religious traditions.